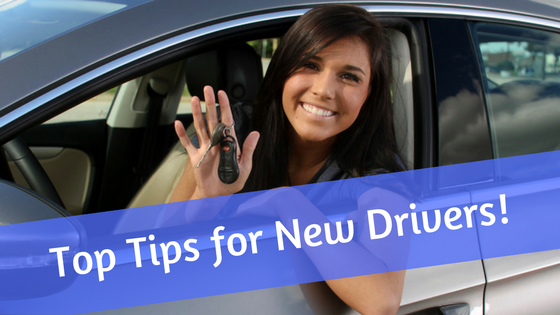 Whether you’re a 16-year-old who just got their first set of keys, or you simply haven’t driven until now, there are copious amounts of rules, regulations, laws and more that I’m sure have flooded your brain throughout your driver education course. The gist of it all is to ensure your safety on the road, and safety begins with you! Your driving is not only imperative for your safety, but also those around you. Welcome to the open road new drivers! I have some tips for you to keep in mind. Familiarize yourself with your car. Maybe you just got a brand new car, or you have been driving the same one throughout your driver’s ed. Regardless, make sure you are familiar with the car you are driving. Know what all the buttons do, where your hazard lights are, how to turn your windshield wipers on and off, how sensitive your gas and brake pedals are, how to adjust your mirrors, where your blind spots are… the list goes on and on. Become confident on the road by gaining confidence within your own car! Become aware of your surroundings. You passed your test to get your license, now become aware of all that surrounds you on your drive! Stay observant of your surroundings while you’re driving, and you’ll avoid and prevent many potential hazards. For instance, look beyond that light that just turned green. Is there someone about to run a red light? Is there enough room for you to make it through the intersection? Start to think about observations like this, and you’ll become a safe driver in no time! Pay attention to traffic signs. You see them everywhere. They’re there for a reason. Whether it’s a speed zone sign or a one way sign, they all have a purpose. By becoming aware of your surroundings, take note of all the signs you pass. This will help you from speeding through that school zone or work zone on accident! Don’t follow the driver ahead of you. You don’t know what the driver ahead of you has planned, or how defensive they may be capable of driving. They may not be following the rules of the road, so don’t let that rub off onto you. Set a good example on the road with your own driving, don’t rely on those around you to. Almost everyone’s life revolves in or around their car. You need it to get to work, to see your friends and family, drop the kids off at school and to complete many other errands throughout the day. The big issue is that we don’t always take the best care of our mighty steed! So what are some quick and easy steps to keep your vehicle looking and feeling good? Here you go: Step 1: Freshen up your scent! That new car smell is one of the best things you can step into. The only problem is that over time, like your favorite black t-shirt, it begins to fade. 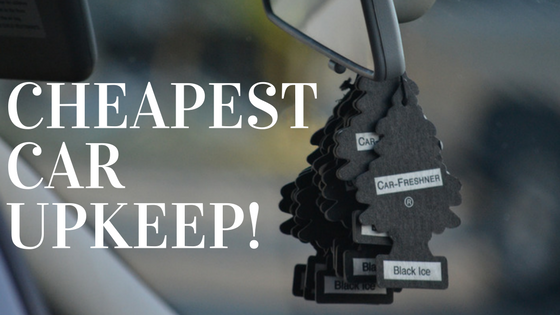 Well instead of letting everyday odors take over, make your own favorite scent the talk of every car ride! To do this, all you’ll need is a wooden clothespin and a few drops of an essential oil of your choosing. After dropping that oil onto the front of your clothespin, clip it on any vent and let the air flow do the rest! Step 2: Wax on, wax off! Seeing streaks when your wipers are on? A quick way to clear those away is by running a cloth or wipe containing alcohol to clean off any gunk left over from cleaning off grime or pesky bugs you may have accumulated on the road. Now you have a clear windscreen and full steam ahead! Step 3: Shine on…with clear headlights! Are your headlights getting foggy? Not only is it extremely important to have a clear view when driving after dusk, it also gives your vehicle a nice look during the day. An easy way to keep your headlights clean and give you the right amount of light is…toothpaste! That’s right! Not only used for keeping your pearly whites gleaming, it can also clear away that grime that’s making your headlights foggy. Use a toothbrush to apply (preferably not the one you use on your teeth) and after covering the whole surface, use a bit of water and an old rag to wipe away. Voilà! Your evening drives will be clearer and safer! There are plenty of ways to keep your vehicle in great shape without spending a pretty penny. Taking a little time to care for it means it’ll take great care of you all year round. Road trips can be long and exhausting. Whether you are by yourself or with a group of people, it can be easy to run out of things to do, making the car ride even more long and dreadful. It can seem like you’re in a car forever longing to reach your destination. 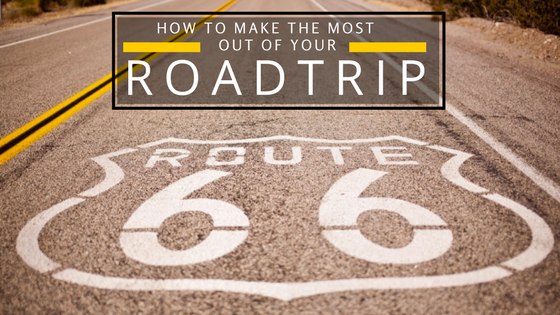 I know this feeling, that’s why I wanted to share some ways you can make the most out of your road trip! Road Trip Playlist Before you venture out onto the road, make a playlist of songs you want to hear during your trip. Add all of your favorite artists and fun tunes that will keep you in a good mood while in the car. Make a fun karaoke game out of it with your fellow passengers! Make Road Trip Games Play word games like “Concentration,” where each person has to stay on beat while coming up with an answer to a topic. For example, if the topic is “fruits,” each person has to name a fruit, but cannot repeat a fruit that has been said or hesitate when answering. Games like this will keep you entertained and are sure to pass the time. Make Pit Stops Have you ever seen those billboards encouraging you to visit the “World’s Largest” and “World’s Greatest” something? Make stops at those places! Visit and explore these small towns and eat at the local diners along the way to your destination. Make sure to take lots of photos too! This helps break the trip and add more memories. Collect Souvenirs Make it a point to collect a souvenir from every town you visit. It doesn’t have to be anything big, but it will help make the trip meaningful. If you’re traveling with friends you can make it a competition. Whoever collects the most souvenirs win! 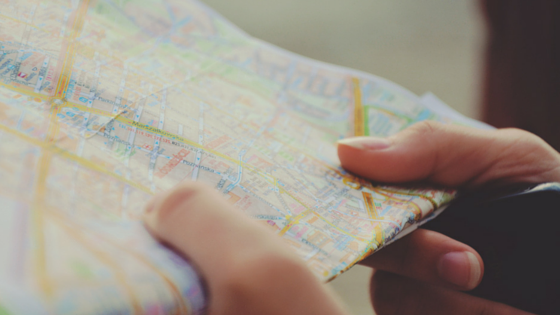 Are you planning on taking a road trip this year? Let me know where you are going! Before you go make sure that your car is road trip ready! It’s the middle of the week, and I thought I’d change things up and give you all some fun facts! Maybe they’ll come in handy some day at trivia night… or maybe you’ll just impress your friends! 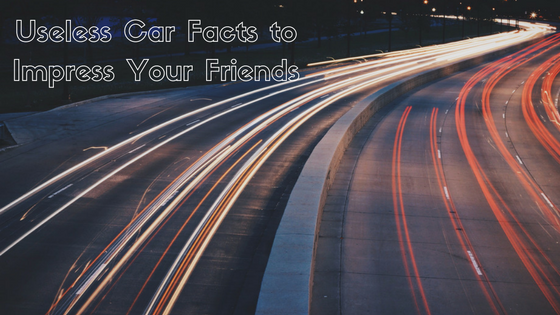 I’ve compiled some of the most interesting car facts I’ve come across. Some of them are quite surprising—enjoy! In 2016, the Lexus ES 300 has been the #1 most likely car to get pulled over, with the Nissan 350Z coming in second. That coveted “new car smell” is actually composed of over 50 volatile, non-toxic, organic compounds. The average American spends about 38 hours a YEAR stuck in traffic! Car wrecks are the #1 cause of death for Americans under 35. There are more cars than people in Los Angeles, California. The inventor of cruise control was blind. Honking your car horn (except in an emergency) is illegal in New York City. However, that doesn’t seem to phase them. Up to 80% of the average car is recyclable. In Shanghai China, red cars are prohibited. In 1924, a Ford cost $265.00! About 60 million vehicles are produced every year, that’s about 165,000 produced per day. Toyota produces 13,000 cars…a day. Only 35% of the world’s population drives on the left side of the road. At the world’s first real automobile race in 1895, the top speed was 15 mph. Texting while driving increases chances of crashing by 23 times. The windshield wiper was invented by a woman, Mary Anderson, in 1905. “Topping off” your gas at the pump can actually lead to long term leak damage. Ice cream trucks are illegal in Iowa. Paved roads were originally intended for cyclists, not cars. To almost instantly cool down your hot car, roll down a window on one side and open/close the door on the other side 5-6 times. In France, it is compulsory to keep a Breathalyzer kit in your car. In Russia, it is a criminal offense to drive around in a dirty car. Residents in Churchill, Canada leave their vehicles unlocked to offer an escape route for pedestrians who might encounter a polar bear on Main Street. In many states in USA, you can be charged with a DUI even if your car is parked, and you’re sleeping while drunk. Your car remote can lose synchronization with your car if a button is pressed more than 256 times when the remote is out of range. In Sweden, your car headlights must be on at all times, even when driving in daylight. If driving 60 mph, and actually possible, it would take less than 6 months to drive to the moon. Now you know more than you probably wanted to! Which random fact was your favorite? Take your new found knowledge and impress someone today! Most of us took drivers ed in some fashion, but that seems like it was light years ago. Do you think you could answer those drivers ed questions now? I thought I’d shake things up a little this week and give you all a fun outlet to exercise your brains. 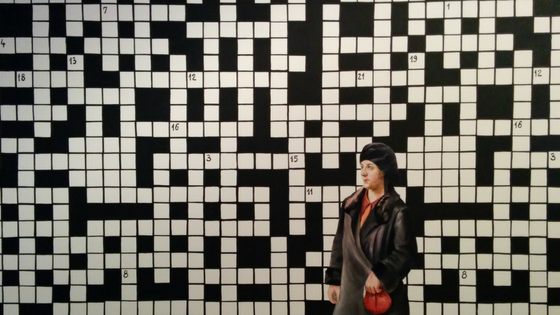 All of the terms used for this puzzle came from a drivers ed handbook! Feel free to print this out, put your knowledge to the test, and scroll down to find the key! A measure of a vehicle’s total consumption of natural resources weighed against the Earth’s ability to regenerate those resources. Also known as “cap cost.” The negotiated price of a vehicle to be leased, and one of the components used to determine the monthly lease payment. A powertrain that combines an electric motor and an alternative means of propulsion and/or power generation. The most common type of this is gas/electric. A fifth wheel/tire that is stored on/in a vehicle for use if another becomes disabled. A high-speed divided highway without intersections. A driving condition where the tires of a car lose traction on a wet road. A strip of land separating traffic going in opposite directions. The privilege of the immediate use of the highway. Pedestrians always have this. Following too close to another vehicle. A payment credited against the purchase price of a vehicle, which reduces the amount to be financed. For a vehicle that has been financed through a loan, this is the difference at any time between what a vehicle is worth at that time and the amount that is then owed on the loan. Abbreviation for Annual Percentage Rate. The cost of credit expressed as a yearly rate. A payment offered as an incentive by the manufacturer to consumers, which is usually applied by the consumer to reduce the net price of a vehicle. The legal document issued by the state in which the vehicle is purchased that reflects the person/entity registered with the state as its legal owner. How did you do? Can you believe this is all from a simple drivers ed handbook? Whether you’ve been following along with my musings about the automotive world, you randomly stumbled upon this post somehow, or you’re just simply interested in cars, this is for all of you! We all are surrounded by cars everyday in some fashion, and it is my goal to give you all the information I can to make the automotive world easier for you. You might think most of these facts are common sense, but you’d be surprised how frequently questions are asked about them. Test your knowledge and find out what is true and what is false! Scroll down to compare your answers. Rotating tires is important because it allows the tires to serve in all positions and keeps them from wearing unevenly. All cars need an engine oil change every 3000 miles. Automobile radiators are coolant exchangers used for heating internal combustion engines. RPM means Revolutions Per Minute, which measures the frequency of rotational speed. Spark plugs are necessary to your car starting. Poor quality spark plugs can lead to a drop in fuel economy. When the engine light comes on, it means you have a serious engine problem that must be checked immediately. Leaving the engine running while putting in gas isn’t actually that dangerous. TRUE. Each car can wear unevenly for a number of reasons, so rotating your tires regularly allows your tires to serve in the front and rear position which helps to even out their wear. FALSE. While some modern cars can put on up to 10,000 miles without fresh oil, every car needs an oil change on occasion depending on the make and model. You don’t have to worry about changing it every 3000 miles, but a change is necessary. FALSE. Radiators are heat exchangers used for cooling internal combustion engines. They transfer thermal energy from one medium to another for the purpose of cooling and heating. TRUE. RPM stands for revolutions per minute and measures the number of rotations (revolutions) completed around a fixed axis in one minute. TRUE. Spark plugs emit a spark of electricity that create the ignition for the combustion needed to start a car. With poor quality or unhealthy ones, your car will not be as powerful and can lead to a fuel economy drop. FALSE. While it could indicate a severe issue needing immediate help, this light usually indicates a detection of a fault in the engine management system. There are a variety of situations that can lead to what the light can mean, and while you should get it checked as soon as you can, don’t panic and think you have to go to the shop immediately. FALSE. Leaving the engine running while pumping gas can potentially generate a spark that can lead to a catastrophic ignition. While there are million-to-one odds that your car will be the one to generate a fatal spark around flammable gas, it still has happened and poses a risk. I would just heir on the side of caution and not bet against the odds. How did you do? I hope this helped debunk some car myths and clear up some commonly asked questions! Send this to your friends and find out who really is the smartest! Sometimes the need for speed hits, and I just want to watch a movie that is totally about cars. If you’ve ever felt the same way, I’ve compiled a list of my favorite car-themed movies to help you get your fix! Check it out: 1. Cars: I’m sure I don’t even need to explain this one—it’s a classic. But for those of you who haven’t seen Cars, just know that it’s got all the creativity and fun of Toy Story, Finding Nemo, and other great Pixar movies, but with an awesome car theme that any kid (or adult) can enjoy! 2. Gone in 60 Seconds: This movie from 2000 has an exciting plot wherein a retired car thief is forced back into the business to save his brother’s life. Sure, the storyline is a little far-fetched, but isn’t that why we love movies? You’ll get sucked into this thriller for sure! 3. Fast and the Furious: Another awesome action car movie! Seeing this one is a no-brainer because of Paul Walker (naturally), but also because the cars and illegal street racing will draw you in and keep you coming back for all the furiously fun sequels. 4. The Love Bug: This old-school Disney movie is about as charming as a car movie can get. 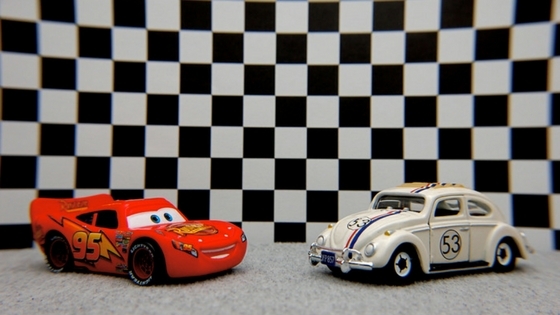 In this movie, Herbie “The Love Bug” is a Volkswagen Beetle with a mind of his own. He becomes a lovable character that really seems to come to life, without any talking at all! His owner is a race car driver who comes to be a champion while behind the wheel of Herbie—an unusual pair to say the least. 5. Drive: Ryan Gosling—enough said. In this movie, Gosling plays a man of many trades: garage mechanic, Hollywood stuntman, and getaway driver. Though he’s trying to get away from a sketchy history, he gets into trouble when he falls for his married neighbor. You’ll have to watch the rest to see how it turns out! If you have a gorgeous cherry red or sleek black paint job, the smallest scratch can be a huge eyesore. 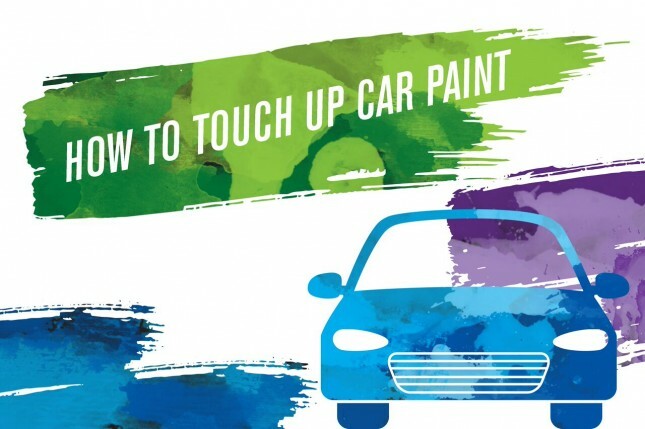 Instead of taking your vehicle in for an expensive detailing and/or paint repair job, consider doing it at home! The cost is significantly less, and it only takes a small amount of time. The first step is to find your paint color. Make sure you test the paint on a metal can or piece of metal to test out the color. When you’re sure you have the matching tone, it’s time to start working. Find a good work space with low humidity and away from direct sunlight. Prepare the spot you’re going to paint and the area around it. Wash and disinfect the spot with grease remover. If there is rust, make sure you get it removed or it could ruin the paint job. Once it’s clean, apply primer. Let it dry overnight where it won’t be touched or ruined. Apply very thin layers of paint and let it dry between sessions. After the paint has been applied and you’re satisfied with the tone, add a clear coat on top of it. You should apply three of four coats of this with about 10-20 minutes of drying time between them. Wait a few days and then apply a rubbing compound to smooth out the nick. Wait at least 30 days before having your car waxed or detailed to ensure the paint has completely set! Summer is here, and that (hopefully) means vacations and road trips galore! However, car trouble can kill those adventures pretty quickly. Although your vehicle needs regular maintenance year-round, driving long distances in high temperatures requires extra preparation. Before you ice up the cooler and throw your suitcases in the trunk, follow these tips to make sure your ride is road-ready: Tires – Don’t wait until one of them goes flat… inspect them before hitting the road. Check your tread using the good ‘ole penny trick. Put a penny in the tread and roll it around. If you can see Lincoln’s eyebrow, you definitley need new tires. Also, make sure they are inflated to the correct levels. The pressure number should be listed in your owner’s manual. Under-inflated tires can explode, which is not the “bomb” vacation you probably had in mind. Air Conditioner – Do I even need to explain?! You’ll be breaking a literal sweat if this bad boy isn’t firing on full power. Even if you think it’s working, it’s best to take your car to a local shop for a routine check. You’ll be amazed at the difference just replacing the air filter can make! Oil – Are you due for an oil change? Check your oil levels and the date you’re due before you embark. If you’re close to the manufacturer-recommended interval listed in your manual, go ahead and change it. Isn’t that better than having your engine light come on during the homestretch of a 26-hour drive? You should also consider opting for a synthetic motor oil, as it performs better for long distances and hot weather. Many people don’t think to roll their car windows down AND have the air running at the same time. I get it—it seems like a waste. However, when you do both within the first few minutes of driving your car, the hot air is forced out faster, allowing cooler air to circulate. In a matter of minutes, the internal air of the vehicle should match the outside temperature, making things a lot more bearable for everyone! We all know how HOT the steering wheel can get in the summer months. Here’s a trick: Turn the wheel 180 degrees before getting out of the car. That way, the side you normally touch is in the shade and staying cool until you’re ready to drive again. Stash a few dryer sheets under the seats! Hot temperatures can make for smelly adventures… A little extra deodorization will make a huge difference. Regularly check your tires! Tires are more prone to blowouts in the summer because drivers are often on scorching roads for longer periods of time. Under-inflated tires are most at risk, since the lack of air pressure puts the tires’ materials under increased strain… but overinflated ones are more likely to hydroplane in a summer rainstorm. Stay ahead of your tread! 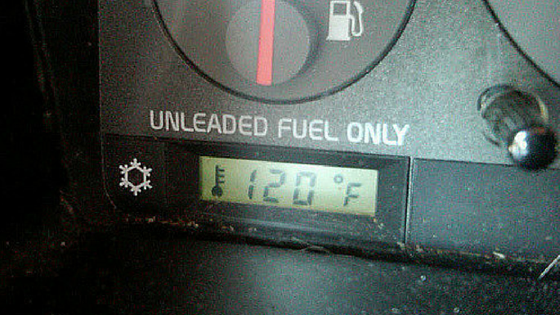 Hot temperatures and low coolant levels increase the risk of your engine overheating and your AC working overtime. 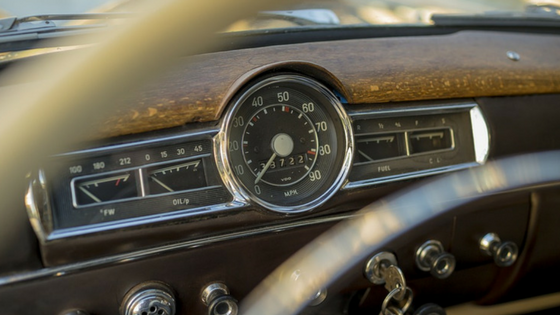 If you see signs of an overheated engine—temperature gauge rising, warning lights, steam under the hood, etc.—pull over to a safe place, turn off the engine, and wait at least half an hour for it to fully cool down before opening the hood. If your coolant levels are low, topping off the tank should do the trick… but if the tank is empty, you might have a leak and will need backup! Spending time in the sun is just as bad for your car as it is for you, as sun damage can cause paint and interiors to fade. To prevent this, park in a garage whenever possible and invest in a sunshade. Also, you can just as easily get burned through a car window as you can on a tropical beach. Wear sunscreen while you’re driving if you anticipate being in the sun!